Recently my husband and I, along with one of our best friends took a much-needed vacation to Portland, Oregon. We wanted to do it in the fall so our friend could experience real chilly weather (she lives in Los Angeles). We found a cabin in the middle of wine country and we enjoyed a full weekend of relaxing, playing games, and tasting delicious Oregon Pinot Noirs. 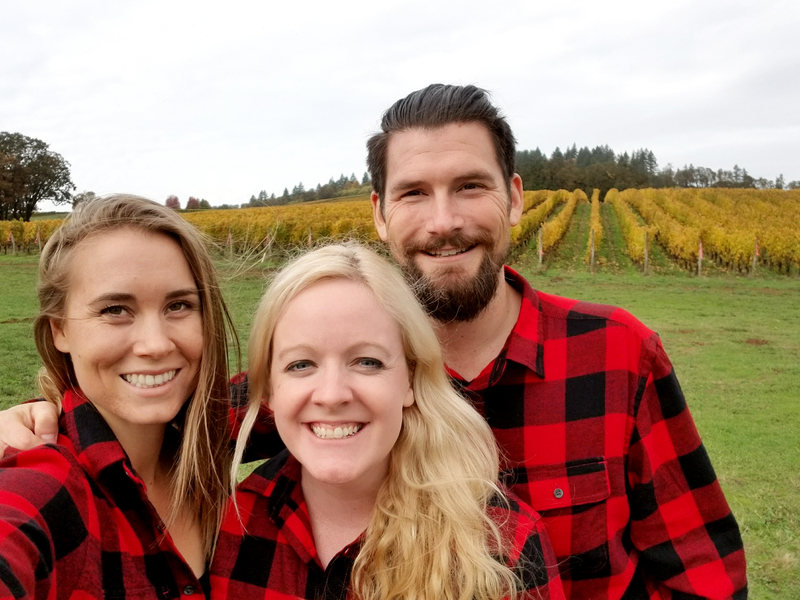 Having never been to Oregon, and convinced that everybody in the Pacific northwest wore plaid (truth), our friend surprised us with matching red flannels, which we wore out ALL weekend. 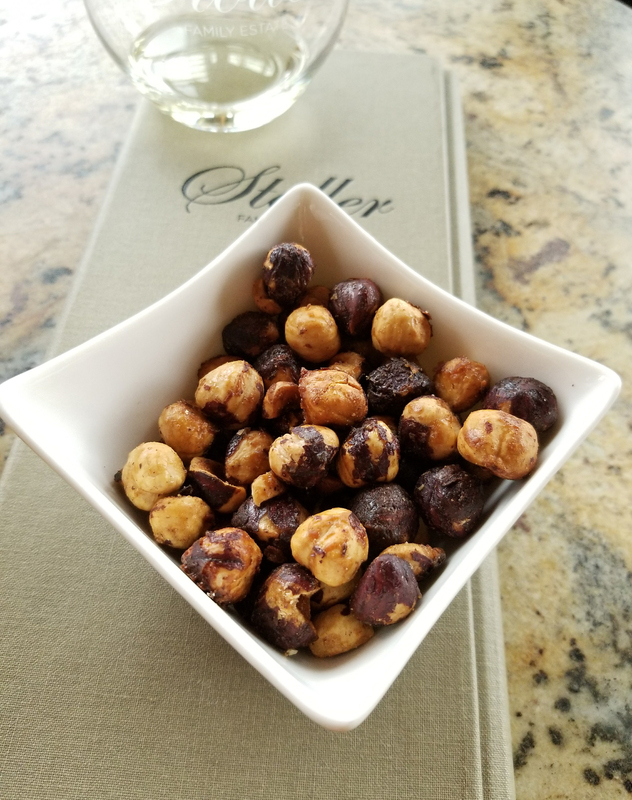 At one of our favorite tasting rooms, Stoller Family Estate, along with the incredible views we were offered spiced local hazelnuts. We tried to pace ourselves but ended up devouring the entire bowl of perfectly salty-sweet-spicy morsels. 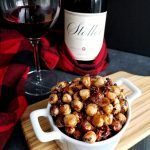 I was inspired to recreate them, because they really are a delicious pairing with wine, and as a vegan and a chef it is always good to have food pairings with wine that are NOT CHEESE. Re-creating these festive nuts would be a project to be proud of on its own, but I wanted to elevate them to the next level. 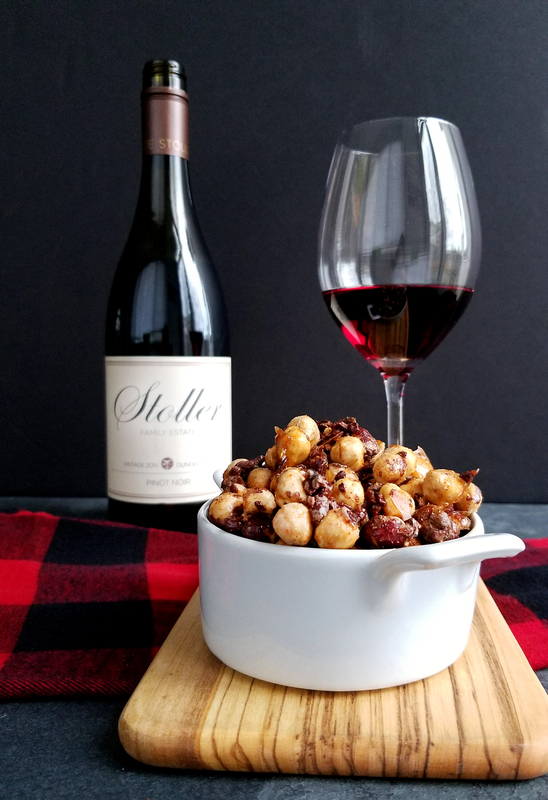 Some familiar food pairings that are always a good blend with Pinots include toasted buttery nuts, warming spices, and my personal favorite dark chocolate. Drizzling tempered dark chocolate onto these nuts would make the ultimate indulgence but knowing how quickly the bowl of roasted nuts went down our throats I wanted to make the mixture decadent without being to filling. 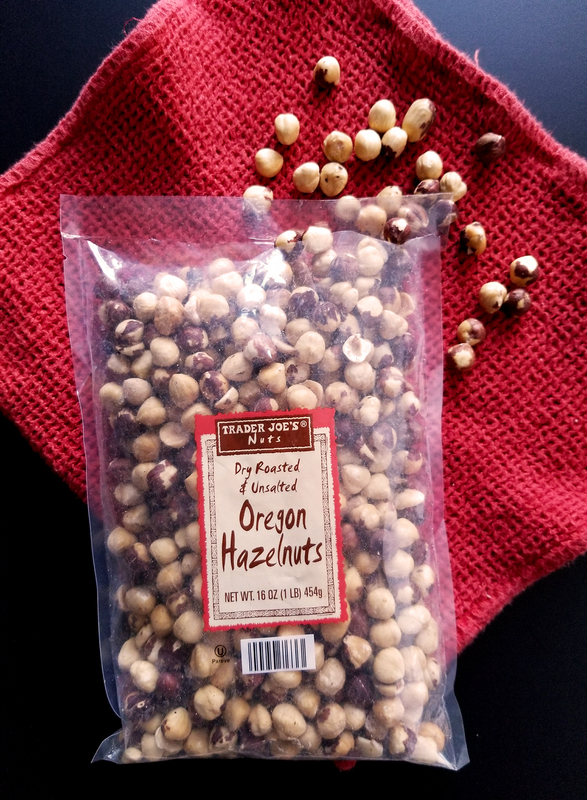 Since whole hazelnuts have plenty of delicious fats, they don’t need to be overwhelmed with melted chocolate (at least right now), but adding whole cacao nibs did just the trick. Adding cacao nibs, the crunchy, bitter bits that eventually get churned into chocolate add a layer of crunch and complexity to the already well-rounded nuts. You hit all five flavor profiles of bitter, sweet, spicy, sour, and salty/umami. Ultimately creating an incredible bite of food on its own, but gets even more magnificent when paired with a delicious glass of red wine. There are many ways to candy nuts, the most known using butter, corn syrup, and sugar to create a thick glaze. I wanted to use a simpler sweet coating that would not be as thick as normal candied nut. Utilizing organic powdered sugar and water, you can develop a thin caramel-like crunch to hold the spices and gives the nuts a nice shine. Using cinnamon, cardamom, cayenne, and salt you get a good balance of warming spices and intense heat. This is a wonderful recipe to make ahead of time for a party, or store it to take on your next weekend in wine country. If you can, double or triple the batch as I can guarantee you will be eating half of them before they make it into the bowl or storage container. These clusters would make the ultimate Christmas gift for friends or family who love wine! When completely dried, place them in a nice glass jar and wrap in beautiful Christmas ribbon, along with a bottle of red. A gift that is simple, homemade, festive, and from the heart! The perfect snack for red wine! 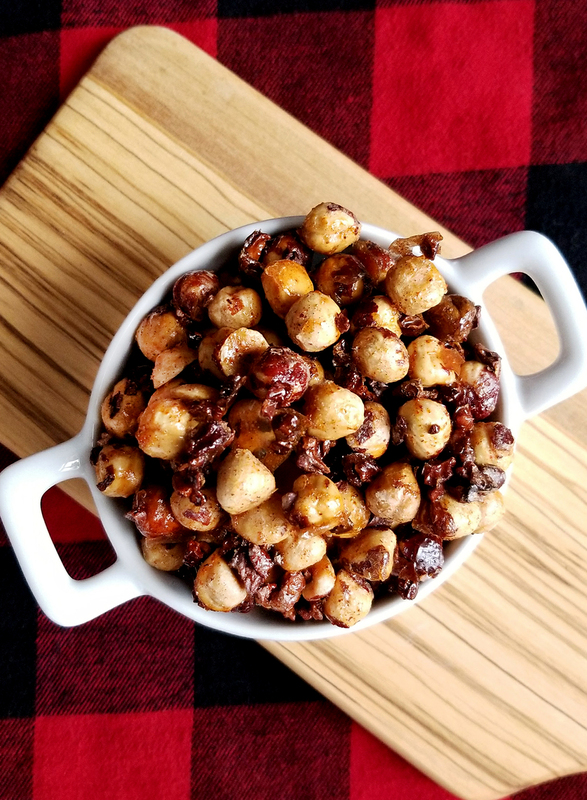 Crunchy, sweet, and slightly spiced with a touch of chocolate, these clusters make the perfect snack or Christmas gift! Preheat oven to 350 degrees. Line a baking sheet with parchment paper or a silicone baking mat, set aside. 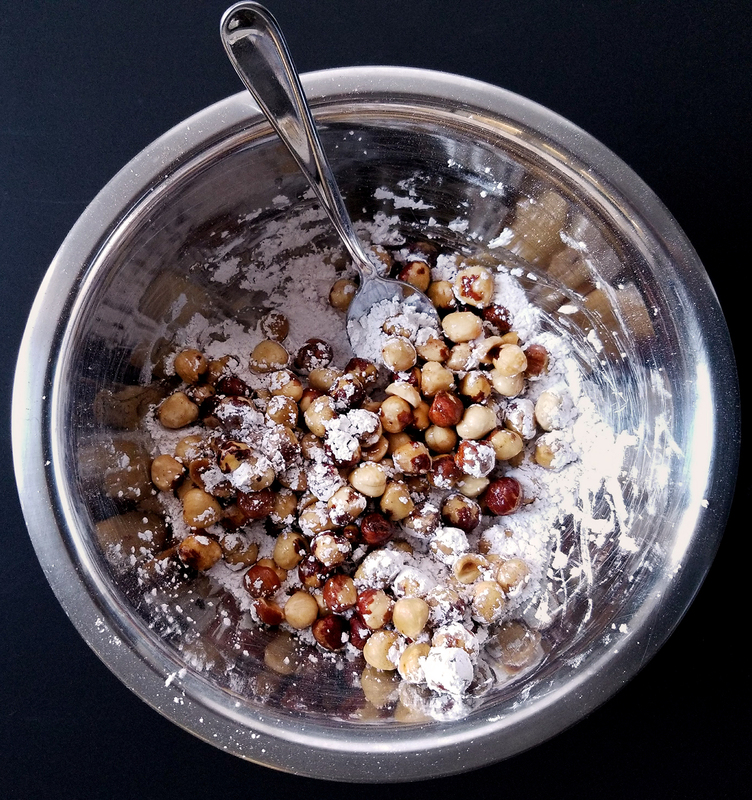 In a small bowl, mix the powdered sugar, cardamom, cinnamon, cayenne, and salt. Place the roasted hazelnuts in a sieve and run under water, coated all the nuts. Place the wet nuts into the bowl with the spiced sugar and mix until a light beige gloss coating forms around the hazelnuts. Add in the cacao nibs and mix. Spread the mixture onto the baking sheet, making sure that the hazelnuts are in an even layer. Bake for 10-11 minutes watching carefully towards the end. Pull out of the oven when the syrup turns golden brown, remove and let cool. Lift the parchment paper and break the nuts into clusters, make sure their is space in between the clusters so they can continue to dry, at least 10 min. When completely dry serve in a bowl or store in an airtight container. 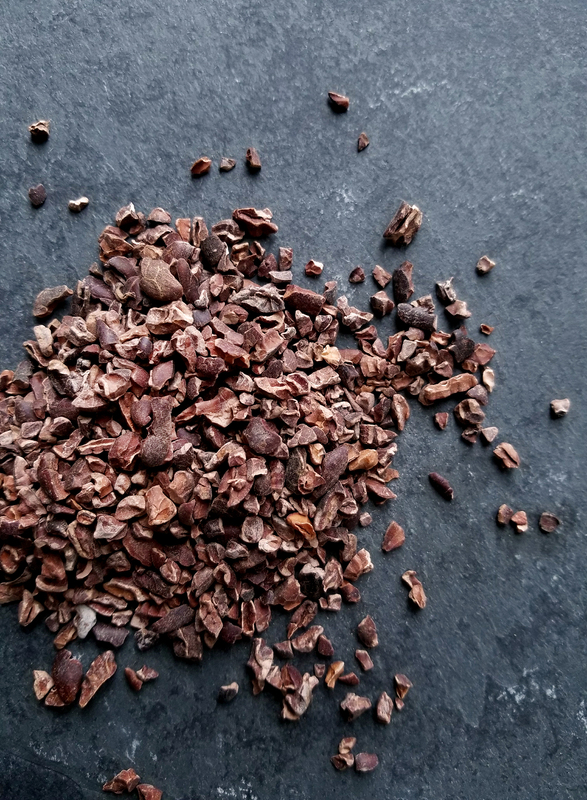 * You should be able to find cacao nibs at most grocery stores, either in the baking section, or the bulk section. You can always find them online. 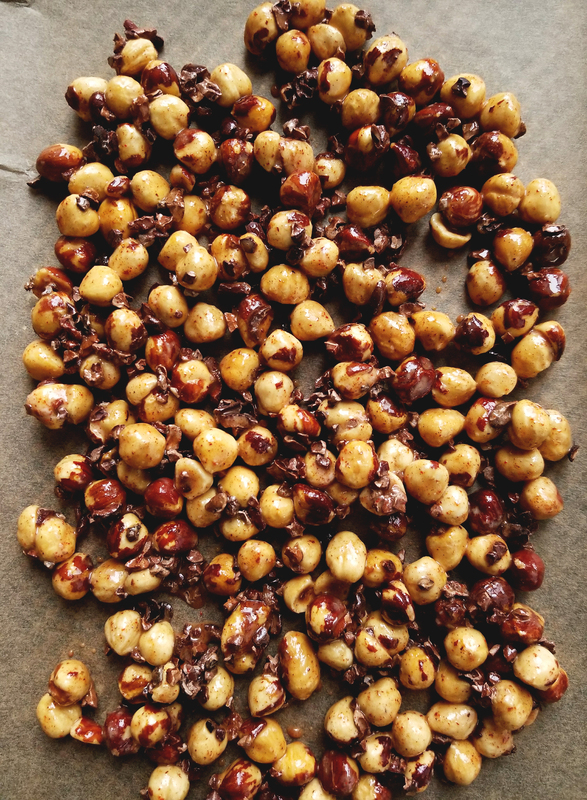 If you cannot find cacao nibs, no worries, they are not necessary to make these delicious nut clusters. Omitting them does not make them any less delicious. * Parts of the clusters may be a bit sticky, just make sure that you give them enough time to air out once they are done baking.